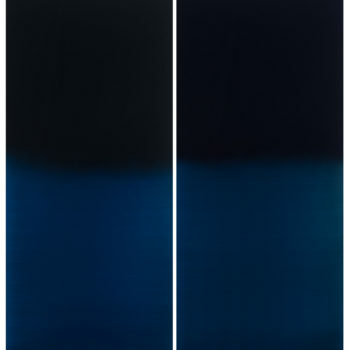 Winston Wächter Fine Art Seattle is proud to announce Tasogare/Twilight (The Time of Moonlight, Sunlight and Starlight), our premiere solo exhibition with painter Miya Ando. The title Tasogare is the Japanese word for twilight, the time of day when sunlight, moonlight and starlight work together to transform the sky. She peacefully focuses our attention on the moment at hand, and reminds us that all time is in transition and temporal. Ando pays homage to her Japanese heritage of sword making and Buddhism, creating meditative landscapes on metal, using dye, urethane and resin. The careful selection of these materials allows Ando to produce pieces, which shift in the light, changing with each angle and viewer. Miya Ando received a bachelor degree in East Asian Studies from the University of California at Berkeley and attended Yale University to study Buddhist iconography and imagery. Ando is the recipient of many awards, including the Pollock-Krasner Foundation Grant in 2012. Her work has been exhibited extensively all over the world, including a recent show curated by Nat Trotman of the Guggenheim Museum. Miya Ando has produced numerous public commissions, most notably a thirty-foot tall commemorative sculpture in London built from World Trade Center steel which is installed permanently at Zaha Hadid’s Aquatic Centre in Queen Elizabeth Olympic Park in London. Her large-scale installation piece ‘Emptiness the Sky’ (Shou Sugi Ban) is featured in the 56th Venice Biennale, in the ‘Frontiers Reimagined’ Exhibition at the Museo Di Palazzo Grimani.